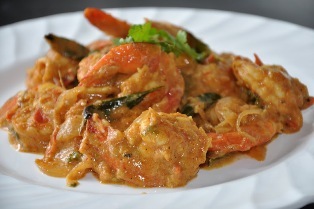 The Indian prawn curry is usually made in the southern states of India ones that are bordered by the sea. However there isn’t just one recipe to make the famed Indian prawn curry because people from each state use their special blend of ingredients to make this dish. However, prawn curries from Goa are especially preferred the world over. So here is a quick recipe for a wonderful Indian prawn curry meal. You will need. Start by grinding the coriander seeds and the cumin together in a food processor. Now roast this masala in a large frying pan once you can smell the aroma add the other spices one by on toasting for 2-3 minutes each. You can also add the pimento once you are done with all the masalas. Let them simmer in the mixture till they are pink. Stir occasionally but try not to over cook. Once the curry is done add a dash of lime juice and it is ready to be served. Ideally you would want to serve this dish with hot boiled long grain rice. The Basmati is the perfect variety to be served with this curry but if you cannot find it you can use any other long grain rice. You could also serve it with some warm buttered naan bread. As a side dish serve some deseeded and cubed cucumber and onion cubes mixed with some yoghurt. Add some salt and pepper to this mixture and you have a delicious meal made in less than half an hour ready to be served. It is sure to get many accolades from your guests.